Following the triumphant 2010 and 2011 UK theatre tours, and 2013 10th anniversary world arena tour, the smash hit Queen and Ben Elton musical, We Will Rock You announces that the show has been reimagined for 2019 and will embark on a brand new UK & Ireland tour, starting at the Churchill Theatre, Bromley (Thu 19 – Sat 21 Sept 2019). Since 2002 over 15 million theatregoers in 17 countries have been thrilled by We Will Rock You’s awe-inspiring production showcasing a number of Queen’s finest hits, including We Are The Champions, Radio Ga Ga, I Want To Break Free, Somebody To Love, Killer Queen, Don’t Stop Me Now, Under Pressure, Bohemian Rhapsody, Another One Bites The Dust and, of course, We Will Rock You. Before closing its glorious 12-year run at London’s Dominion Theatre, the show was performed an astonishing 4600 times. 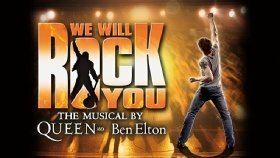 The touring production of We Will Rock You reaches theatres carrying with it an impressive legacy: when it first became news that one of Britain’s most phenomenally successful comedy writers Ben Elton was teaming up with legends of rock, Queen, for a musical there was much speculation on what such a unique collaboration would turn out. So impressed after attending the original workshop, screen icon Robert De Niro and his company Tribeca came on board as American partners. De Niro continues to support the show, even making a special visit to London in 2013 to help celebrate the 10th anniversary in style. The audience erupted with thunderous applause, as he joined the cast on stage after the landmark performance. I absolutely love We Will Rock You .. Please please come to Crawley , West Sussex . I saw it at The Hawth a few years ago and up in London too .. . I was so gutted when it finished.. He deseado desde hace varios años poder asistir al espectáculo We Will Rock You, pero finalizó en 2014. Soy de un país suramericano y tendré que solicitar visa para ingresar al reino unido y la razón principal para visitar ese Estado, seria por el mencionado espectáculo. Según lo arriba indicado, habría una presentación del espectáculo para la primera semana de octubre de 2019, lo cual seria perfecto por mis vacaciones. Por ello, agradezco confirmación sobre la realización del espectáculo y si para esas fechas se efectuara, ya que la planificación para poder asistir me llevaría casi seis meses por cuestiones laborales y otros asuntos personales y de tramitologia.